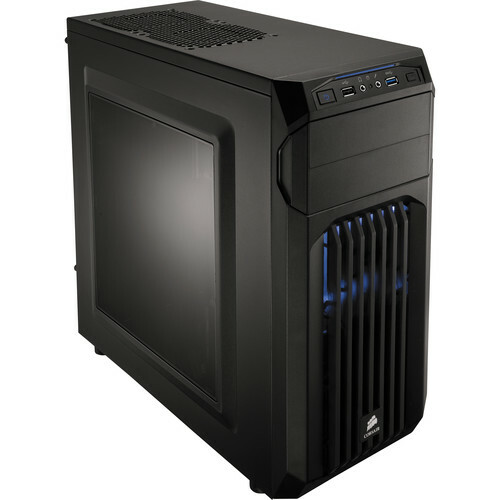 The Carbide SPEC-01 Mid-Tower Gaming Case from Corsair features a side panel window to view your components, and an LED-lit front intake fan that draws cool air directly to your graphics cards. It can fit up to five fans, and the four combination hard drive / SSD trays make storage installation and upgrades quick and easy. Cable routing cut-outs help you reduce clutter, and the built-in dust filters help protect your components. The case has a USB 3.0 front port with an internal connector. Internal Drive Bays 4 x 2.5"
Box Dimensions (LxWxH) 21.0 x 19.0 x 9.0"
Carbide SPEC-01 Mid-Tower Gaming Case is rated 5.0 out of 5 by 1. Rated 5 out of 5 by Robert from it is a good case It is a nice case in the way it was made. although if you are the person that wants a lot of bright rgb lighting then this is not the case for you. for my build i chose to just stick with the blue lighting. I will say that the led lighting on the fan that is built on the front of the case is soothing and goes well with all black components. the case side panel with the window is shaded so it makes the lighting pop. The only problem i have with it is the led cord for the built in fan is kind of short, but this might be only a problem for me and can be easy fixed with an extender cord. PROS it is a good first time build case with easy to fallow instructions with a good fan in the front that will give plenty of air flow without needing a second or third fan. the case is nice if you want to go the simplistic why of lighting your case. CONS the window can be a problem if you are wanting flashy lighting than this case might be harder to work at. Does this case include a red LED fan or a blue one like the picture? The LED color would be red.